Shares of Netflix NFLX have skyrocketed over the last year as investors continue to love the growth prospects of the streaming TV and movie giant. Now the question is what should they expect going forward from Netflix as the internet-connected TV space becomes more crowded. Netflix might be the unquestioned streaming king at the moment, but Amazon AMZN Prime, Hulu, and others have plans for expansion. Meanwhile, Apple AAPL has spent heavily to scoop up an array of Hollywood talent both in front of and behind the camera for a 2019 launch of some-type of streaming TV service, with Disney’s DIS much-anticipated stand-alone over-the-top streaming platform scheduled to launch in late 2019 (also read: Assessing Apple’s Streaming Push to Take on Spotify & Netflix). But the competition doesn’t seem to scare Netflix since it has anticipated the rise of streaming content and the slow death of linear, commercial-based television for years. “In a few decades, linear TV will be the fixed-line telephone: a relic,” the company wrote in its long-term outlook overview. And this is why Netflix has ramped up its original content spending for years because having programming worth paying for is really the company’s core business—a model HBO has proven for years. Netflix noted that it expects to spend close to $8 billion on a profit and loss basis on content in 2018, while also shelling out roughly $2 billion on marketing. The streaming company also plans to spend around $1.3 billion on technology and development this year. Some have speculated that Netflix might eventually expand beyond its current on-demand TV and movie model to offer some live news or sports, with the likes of Facebook FB, Twitter TWTR, and Amazon all jumping into live content. Yet, for now, Netflix maintains that it is a “movie and TV series entertainment network” and will not stream other types of video. Netflix has landed some big names to produce new content for the platform, which will be needed to entice new customers but even more valuable for keeping current users. It is also worth noting that Netflix’s content is pretty much unlimited in duration, in the sense that a user can begin an older series, such as House of Cards, for the first time years after its debut. The company added 7.41 million new members in the first quarter, which marked a 50% jump from the year-ago period and topped the company’s forecast of 6.35 million. The streaming company closed the quarter with 125 million members. Looking forward, Netflix expects to add 6.2 million new members to bring its total to 131.2 million, which would represent a roughly 26% surge from the year-ago period when the company closed the quarter with 103.95 million members. More specifically, Netflix expects to add 1.2 million new users in the U.S. to bring the total to roughly 58 million, up approximately 11.5%. The U.S. market is by far its most saturated, but the company still maintains that it can grow to between 60 to 90 million members in the U.S., based upon its trajectory to date and the continued growth of internet entertainment. The company projects it will expand its international user base by 5 million in Q2, to hit 73.29 million, which would mark a roughly 41% surge from the 52 million it claimed at the end of the second quarter of 2017. Netflix, which is currently available almost everywhere except China, could become even more massive if it is able to sell its service in the world’s second-largest economy. But this is certainly a big if. 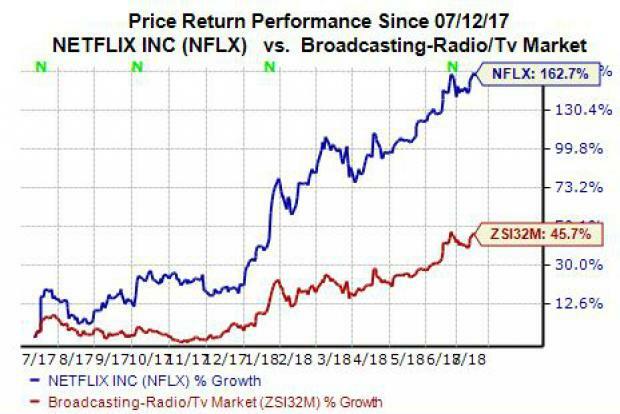 Over the last month, analysts have upped their NFLX price targets in big ways. Goldman Sachs GS analysts reiterated the firm’s buy rating for NFLX and upped their price target from $390 per share to $490 per share. GBH Insights upped its price target to a whopping $500 per share, less than a week after Goldman, which marked the highest out of the 36 analysts who cover Netflix, according to FactSet—shares of Netflix closed Monday at $415.63. “Our bullish thesis on Netflix is based on our belief that the company’s competitive moat, franchise appeal, ability to increase international streaming customers through 2020, and original content build out will translate into robust profitability and growth,” GBH analyst Daniel Ives wrote in a note to clients. Our current Zacks Consensus Estimates are calling for Netflix’s Q2 revenues to surge by 41.32% to reach $3.94 billion. The company’s full-year revenues are expected to climb by nearly 38% to touch $16.12 billion. At the other end of the income statement, Netflix’s adjusted Q2 earnings are projected to skyrocket 433% from $0.15 per share in the prior-year period to $0.80 per share. For the full-year, the company’s earnings are expected to climb by 131% to touch $2.89 per share. Netflix is set to release its Q2 financial results after the closing bell on Monday, July 16.